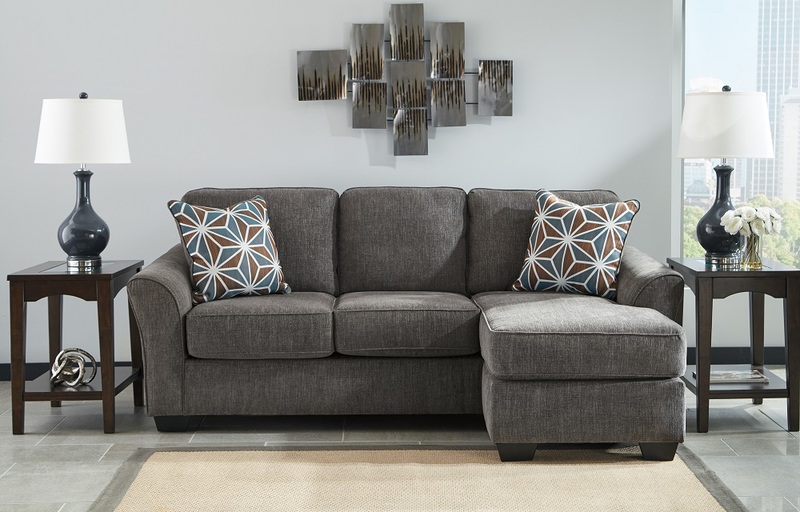 Couch Potato Clearance Brise Sofa Chaise The on-trend Brise sofa chaise is so casually contemporary. The 1970s era meets modern day allure with an energetic geometric pattern on the toss pillows. Paired together with slate colored menswear chenille, it’s incredibly comfortable and a show stopping sight.<br /><br /><br /><br /> Frame constructions have been rigorously tested to simulate the home and transportation environments for improved durability. Corners are glued, blocked and stapled. Seats and back spring rails are cut from hardwood and engineered lumber. Stripes and patterns are match cut. All fabrics are pre-approved for wearability and durability against AHFA standards. Cushions are constructed of low melt fiber wrapped over high quality foam.<br /><br /><br /><br /> 89x61x39H<br /><br /><br /><br /> Seat depth 45.00\"<br /><br /><br /><br /> Seat height 21.00\"<br /><br /><br /><br /> Distance between arms 70.00\"<br /><br /><br /><br /> Top of cushion to top of back 17.00\"<br /><br /><br /><br /> Arm height 27.00\"<br /><br /><br /><br /> Minimum width of doorway for delivery 32.00\"<br /><br /><br /><br /> Chaise foundation 27.83\" x 21.50\" x 11.54\"<br /><br /><br /><br /> Leg height 3.00\"
Chaise foundation 27.83" x 21.50" x 11.54"